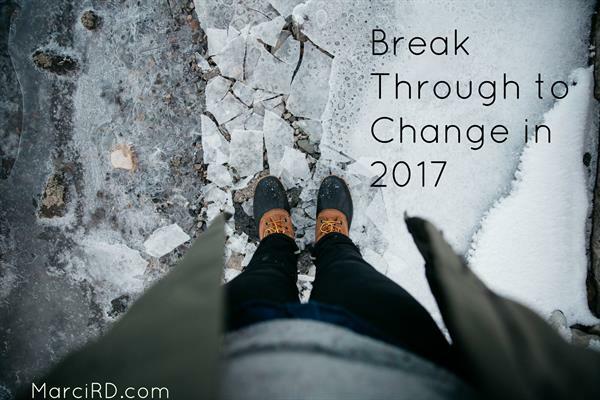 Resolutions: Making change a reality - Marci R.D. Sound familiar? Making resolutions is a popular topic, since it’s what we are “supposed” to be doing this time of year. Dreaming up what we want to dobetter than the year before seems to be an obligation at the end of December. Let’s face it, change is hard. We humans are wired to repeat habituated patterns. BUT, thanks to neuroscience we know that our brains are plastic! That means we are capable of changing. So if you want to see yourself accomplishing something specific this year,I don’t think it matters if you call it a resolution or a goal. You just need a plan to support your efforts. I see positive change happen on a daily basis. My clients who suffer from an eating disorder do some of the toughest and most amazing change work I haveever witnessed. So the ability we have as humans to progress and become healthier, happier, and better is something I believe in! So here are 6 things I learned to make resolutions and change stick. 1.Dream big but start small. Choose 1 very very specific thing to work on. When you get good at that one thing, move on to the next. 2. Chart your plan. Once you identify that one small step, think through all the logistical details you need to make it a reality. 3. Be vocal. Let your family and friends know your intentions and how you’d like them to support your efforts. 4. Get support. If you are feeling stuck you may want to consider finding a coach, counselor, therapist, or dietitian. 5. Don’t give up! It’s hard work re-wiring our brains to stick to new habits. It’s consistency that wins the race so stick with it. 6. Reward positive behavior (that helps reinforce those new neural pathways) but not with food! Wishing you a health, happy, and safe New Year.